Dutch Queen Máxima, one of Europe's most stylish royals, opted for an Irish designer to add that certain je ne sais quoi to her outfit during a state visit to the UK. 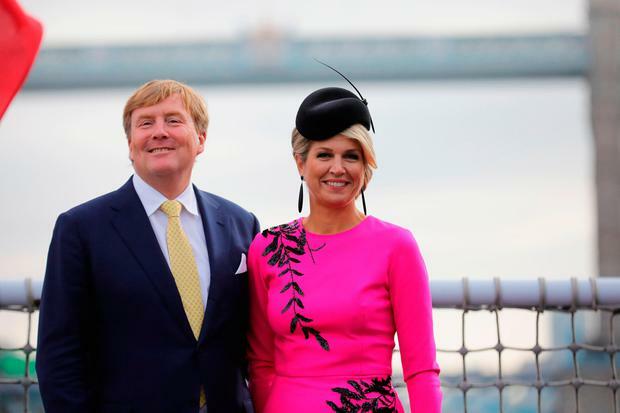 The mother-of-three, who worked as an investment banker in her native Argentina before marrying King Willem-Alexander in 2004, has become a royal fashion icon for her preference of bold colours and dramatic headwear. Her second day appearance in London was no exception to the adventurous Máxima that royal watchers have come to expect as she beamed in a fuschia fit and flare dress by Oscar de la Renta, and chose a handblocked coffee bean beret in velver with spine and Swarovski crystals charm by Galway native Philip Treacy as her most statement-making accessory of choice. Her pink-and-black combination encapsulates her penchant for devil-may-care dress and her refusal to play by anybody's else's wardrobe rules but her own. Treacy was a fitting choice for the queen as he has long-standing links to royals the world over, including Kate Middleton, Meghan Markle, Princesses Eugenie and Beatrice, and he's the milliner of choice for A-listers like Victoria Beckham and Sarah Jessica Parker. Treacy, who was born and raised in Ahascragh, said he was always drawn to his craft, making clothes for dolls even as a child, and will never forget his father's support in his passions from an early age. "I have come from a very humble background, I have made hats for kings and queens," he said. "One of the strongest memories I have is being in somebody's house and my father's friend saying 'don't you think that's a little odd, don't you think it's a bit strange this child is doing this?' And I remember distinctly my father saying: 'Whatever makes him happy.' It moves me still." The London-based designer said he would not be where he is today without the support of the British royal family. "If the royal family decided not to wear hats... then I wouldn't be sitting here having this conversation with you, because hats are part of the culture of Britishness," he said. Their stamp of approval has granted him an international platform, which has officially reached the Netherlands - or, at least its queen. Much has been made by the couple's arrival as it marks the first official visit by the Dutch royal family to the UK in 35 years. A number of European royals have visited Britain in recent months as royals on both sides attempt to foster a positive working relationship in preparation life post-Brexit. On Tuesday night, a state dinner was held in Buckingham Palace to honour the visitors.